Wedding gowns consist of elegant fabrics and intricate designs, which makes them extremely beautiful, yet difficult to alter. Our Expert Tailors and Seamstresses have put together a few tips help brides better understand their gown and how it is altered. Be sure your gown is cared for by an experienced seamstress who specializes in the intricacies of wedding gowns and formal evening wear. The hem refers to the finishing edge of your gown. Adjustments to the length of a gown are done by modifying the hem. The length of a gown plays a big part keeping the hem clean and preventing brides from tripping over their gown. The hem should be about a half inch from the floor. This adjustment can be made in a number of ways. A hem should be adjusted by cutting and sewing the bottom of a gown unless the gown has details, such as beading or lace, along the hem. In this case the adjustments should be made at the waist. 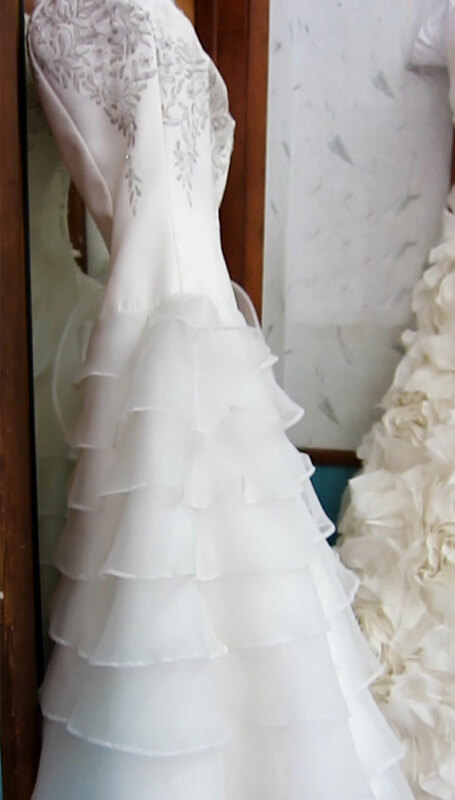 If the gown does not have a separation at the waist ( like the Gown below) then the length adjustment will have to be performed by removing the design along the hem and replacing it once the length is properly adjusted. The bustle is sewn in after the hem is done. The bustle is designed to pin up the train after the wedding ceremony so the bride can walk around and dance comfortably during the reception. There are different types of bustles that work better with different dress designs. However, the two most popular are the French Bustle and the Traditional Bustle. In general it is easier to take a gown in a few sizes than it is to let it out. Most gowns can be taken in up to 3 sizes, however, when it comes to letting a gown out the range changes from 0 to 2 sizes. Size adjustments to a gown can be made wherever there is a seam. If the gown has a design along any of the seams than the sizing adjustments should be done on the sides with the least amount of embellishments. Otherwise the prominent parts of the design will become distorted. Design distortion Take-in (image below): The Design is too close together and disproportionate to the rest of the design. Design Distortion Let-out (image below): The design is missing in sections due to the let-out being done in areas with stitching. To avoid distortion or if there is beading or lace along the that covers the seam (like in the image below), the seamstress must removed the details in order to perform the alterations. Once the size adjustment is complete the beads are sewn back onto the gown in the same exact pattern as the original. Some gowns that zip in the back can be let out by replacing the zipper with a lace back, which allows for more room. Alterations that are done on dresses with layers require considerably more work. For example, to take in a gown with layers requires a seamstress to taken in each layer individually. 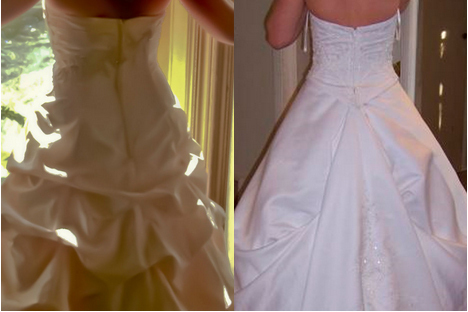 The same goes for shortening gowns; when shortening a gown with layers, each layer must be shortened individually.